Giuliana Rancic hits the red carpet in State Room Jewelry at the 20th Annual Screen Actors Guild Awards on January 18th, 2014 in Los Angeles, CA. 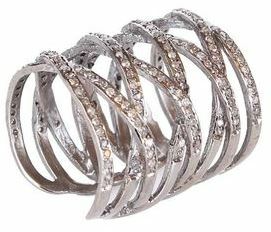 Giuliana wore the Silver Lattice Ring in White Diamonds by State Room Jewelry. State Room Jewelry is the line by Sarin Minassian whose collection offers both subtle, elegant pieces to bolder, statement ones. The collection is inspired from trends from around the world, and provides pieces that can transition from day to night. State Room Jewelry has already been spotted on celebrities like Vanessa Hudgens, Jessica Alba, and Blake Lively and is available for purchase at http://www.stateroomjewelry.com. This entry was posted in Celebrities, Jewelry and tagged Giuliana Rancic, jewelry, Screen Actors Guild Awards, State Room. Bookmark the permalink.